Dani Montague first thought of opening a gallery devoted to glass art two decades ago, but it wasn't until her retirement from a career with March of Dimes, where she served as vice president of philanthropy, that she was able to realize her dream. This past February, Montague proudly unlocked the doors of Montague Gallery in San Francisco's Union Square area, home to many established galleries, for an opening reception that also served as a benefit for the Pilchuck Glass School. “I came from the nonprofit world, so I thought it would be great to launch my new business, my new art gallery, with a benefit,” she said in a telephone interview with GLASS Quarterly Hot Sheet. Montague is coming at the world of glass from a place of admiration. When considering what exactly she wanted to do after departing from non-profit work, she decided that she wanted to open her own business doing something that she loved. A glass gallery seemed the perfect fit, given her love for art glass. “I think it’s such an incredible medium, and I love it and I would love to give other people the opportunity to learn about it and support it, so that’s what I wanted to do,” she said. 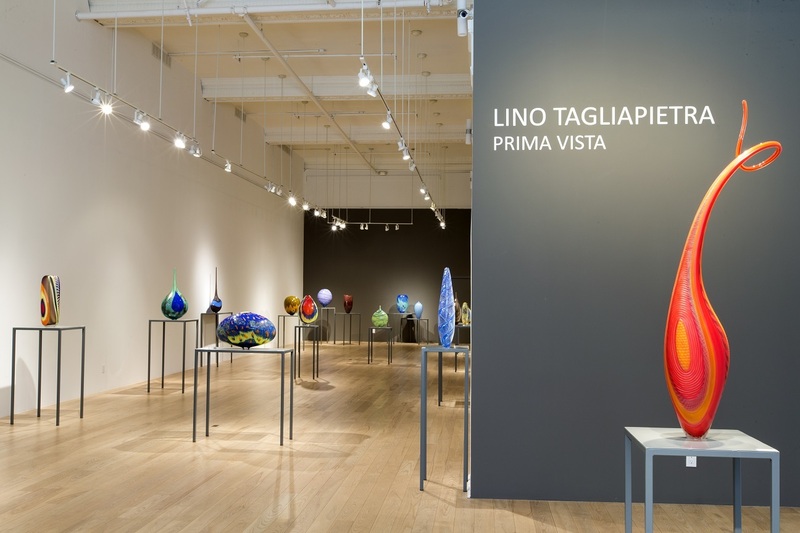 Since her personal experience with glass other than as an admirer was limited, Montague hired Sandy Sardella, formerly the owner of Pismo Galleries of Colorado, as a consultant. The two met when Montague visited Pismo on her many ski trips to Vale and Beaver Creek, Colorado, and her planning for her first show at the gallery coincided with Sardella’s retirement. Sardella provided both wisdom and connections, bringing in names like Lino Tagliapietra and Dante Marioni for Montague’s first two exhibitions. Part of the change that has come into the industry has been the advent of social media and ever-advancing technology, which has seen some established gallerists focusing on art fairs, or online sales, rather than operating a bricks-and-mortar gallery location. Montague has confidence that while some aspects of technology can be harmful to small galleries, it may work as an advantage in a geographic area with its finger on the pulse of technology and social media. “Glass art involves engineering and science and technology,” she said. “So I feel like there should be a lot of interest in this medium, given that there are a number of parallels to our market here, being so focused on technology and science.” The Montague Gallery website even features a “Discover” section, which has the look and feel of Instagram, where collectors can quickly browse the work that they carry in a less structured way. Montague said that the gallery would also be open to the idea of selling work online and through social media in the future. “I definitely expect and plan that we’ll be doing more and more around social media,” she said. The gallery already utilizes Instagram for marketing purposes. Still, the physical gallery, not the social media platform, is the core of the dream that Dani Montague is realizing. While selling art through social media and the Internet in general can be convenient and inexpensive, Montague believes that without actually seeing the work in person, it is difficult to really see what makes it special. This is especially true of glass, which can look entirely different depending on its lighting and positioning. “I do feel that it’s important to have a place where people can come and see the work in person,” she said.